Silly Sally's CD's are guaranteed to keep kids entertained and engaged. There is non-stop fun on both CD's and they come with Silly Sally's famous "Even the Dog Will Love It" Money Back Guarantee! Why are these Kids CD's great? Age-appropriate activities for kids two to nine - your kids will relate to the tunes and moves. Original characters - you won't find a mouse or a singing dino on these CD's! Created by a teacher, professional clown, and musician - an experienced educator with hands on appreciation of what makes kids tick. Movement-oriented - kids will dance and exercise while having fun. With the ever-rising childhood obesity rate, exercise is an important key to help solve this problem. A blend of original music and kids' classic favorites - new tunes you have not heard a hundred times before and oldies rearranged to make them new again. Easy to follow movements - nothing complex or difficult to learn. 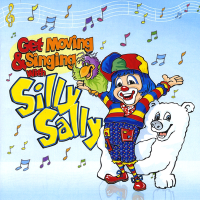 “Get Moving and Singing with Silly Sally” is an eclectic mix of songs that includes a polka, tango, Irish Folk song, show tune and other original tracks that are sure to be a hit with kids and grown-ups too. This album has something for everyone and will teach kids about staying healthy and encourage active participation through movement and singing along. 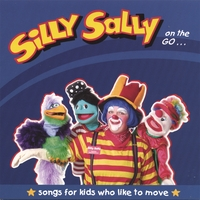 "Silly Sally On The Go" is Sally's first release and is packed with songs that are sure to entertain and get kids moving. Do You Know the Muscle Man? Parents and kids from all over have told me they love these CD's. I'm so confident that your kids will love either CD that I offer a simple money back guarantee: If you don't like either CD, don't keep them. Heck, if the dog doesn't like them, don't keep it! That's why I call this my "Even the Dog Will Love It Money Back Guarantee." You can buy lots of CDs, but almost none other comes with such an iron-clad guarantee. I've offered this money back guarantee since I started selling CDs and nobody has ever returned a single one - nobody!